Where can your degree lead you? Career Services can help students explore careers, find internships and jobs, launch careers, and pursue their professional goals. We work closely with employers to develop internship and full-time opportunities for UW-Eau Claire students and graduates. Handshake is a powerful tool to to find work-study and part-time jobs, internships and full-time opportunities! 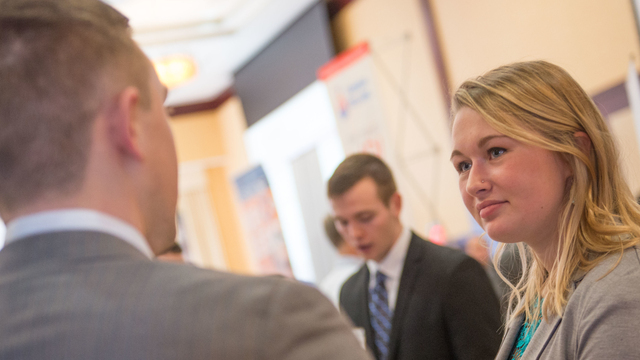 Whether you are a student looking for a job, an employer needing to fill a position, or an alumni seeking a new career path or needing resume advice, Handshake is the place to get started. Log in today. Are you curious about specific jobs that Blugold graduates have landed since walking across that commencement stage? We are too, so we've collected some examples in a database you can search by major. If you are struggling with a career decision, need help on your resume, or aren't sure how to get started with the internship and job search, schedule an appointment with a career counselor through Handshake. The Career Services office makes it very easy for employers to recruit, interview and hire Blugolds. From our Handshake software to career fairs and interview days, we do the leg work and you can just plan to come find amazing new employees. The proof is in the numbers: Where are they now? See what our most recent graduates tell us they are doing. Take a look at the key numbers from the most recent First Destination report. Recent Grads, tell us what you are doing after graduation.